Shop BedHead Pajamas online at BedHeadPJS.com for their exclusive line of comfortable and cute pajamas designed by the talented and in-demand designer Renee Claire. All of the garments sold by BedHead Pajamas are made in Los Angeles using 100% fine cottons, and range from spa robes to a full cotton nightgown line. Whether you're a gal shopping for herself or a guy looking for unique gifts for the woman in your life, you can't go wrong with the high quality, stylish, and comfortable PJs and more from BedHeadPJs.com. Check back often with 58Coupons.com for the latest BedHeadPJS savings, BedHeadPJS discounts, BedHeadPJS promotions and BedHeadPJS coupons for BeadHeadPJS.com. Stock up for Spring & Summer with these beautiful chemise gowns at Bed Head Pajamas. While Supplies Last! Rush over to bedheadpajamas.com to save $69 on select robes while supplies last. Check out BedHead's great selection of PJs and you can save $96 while supplies last. For a limited time only enjoy a $40 savings on select Ballet Slippers from BedHead Pajamas. 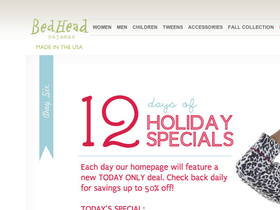 Check out BedHead's great sale selection, where you can find savings of up to 70% off regular prices! Click link for selection.